I read about this place recently that gives me the heebie-jeebies. Nothing jumps out at you. There are no clowns running around with chainsaws, no zombie barbershop quartets. There is only the quiet, and a lot of it. Holding the Guinness World Record for being the quietest place on earth, Orfield Laboratories is a research facility that businesses can use to measure the volume of things like clicking buttons and such. But when a person enters the sound proof chamber, it becomes something of an endurance challenge. You start hearing the only thing available–your own body. As I sit here and write this post, I’m listening to music (“It’s All Crazy! It’s All False! It’s All A Dream! It’s Alright” by mewithoutYou – genius album by a genius band) because I’m not one who does well with silence. And I can only imagine the horrors of listening to my internal body noises. 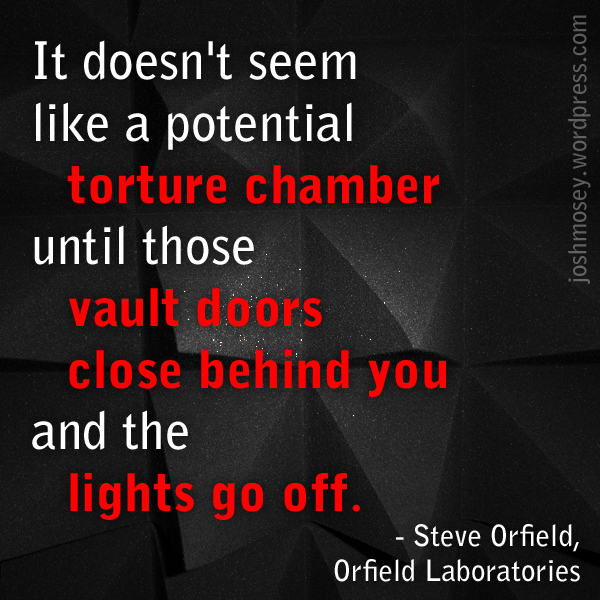 According to the owner of Orfield Labs, Steve Orfield, most people cannot stand more than about twenty minutes in the chamber before becoming disoriented and confused. The morbidly curious part of me wonders how long I could last in the chamber. The sane part slaps that part. The sci-fi writer part of me wonders if perhaps I’m already in the chamber and this blog of mine is my way of reaching out to reality. If that last part is true, I guess someone should come get me and wake me up. What are your thoughts on silence? Do you prefer music or noise when you work? How long do you think you could last in the chamber? ← I am an Apple lover. I’m pretty sure I could live there. I prefer silence and often. When I worked at the UoM one of my jobs was to confirm the Engineering measurements for certain research facilities. One such event was the silence acoustic chamber. The blue prints measured only the structural outer room, not the isolation baffle chamber. My boss was like you and didn’t want to go in. It was so sound proof that 2 people could not hear each other speak face to face. The tech gave me instructions of how to measure without ruining the baffles, and across a little bridge I went with a promise he would return in 30 mins to let me out. I listened to my breathing, my heart for a few minutes took out my tape measure finished the job and laid down on the chamber floor for twenty minutes. It was wonderful. Very relaxing. I thought I would be claustrophobic, but it was big enough and I loved the quietude. Clearly I loved it and have vivid memory to this day. It was awesome. I start to feel really down with too much silence. Podcasts are a life saver.